There should be just one connection per device, period. The line scan application shown here which is remotely illuminated and triggered with signals derived from a shaft encoder would be complicated to achieve with conventional devices, but requires only simple Ethernet connections when built with Opteon components. Eliminating wires and connections in a modern solid state system is the most powerful way to increase system reliability. Fewer wires also means less complexity, lower costs, and much faster deployment. Continuous real-time monitoring is available during normal and abnormal system operation of the electrical quality of each connection and automatic checks for the timely arrival and validity of every transmission expected to occur among system devices. Logging of the exact timing of all operations throughout the imaging system is also provided. Opteon tools enable vision developers to graphically designate all of the communications necessary to coordinate system operation in a way that guarantees all of the connections will function properly. 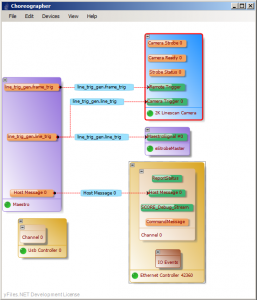 The drag and drop graphical environment displays and ratifies your connections as you make them. If the tool tip results in a connection on the screen, it will function precisely as you planned with timing accurate to the microsecond.